Leiden: Brill, 2010. 5 vols. Vol. 1, A-C: 698 pp. ; Vol. 2, D-I: 655 pp. ; Vol. 3, J-O: 637 pp. ; Vol. 4, P-Z: 695 pp. ; Vol. 5, Index and Resources: 499 pp. $1,099. If Jews in Muslim-majority countries have shrunk to a miniscule 50,000 souls, nearly all of them in Morocco, Turkey, and Iran, things were once different. Until the 1970s, there was very little academic work on the Jews of the Islamic world, and most of that was dedicated to the medieval period, and within that period to intellectual history and literature. The 1.5 million-word Encyclopedia of Jews in the Islamic World came into existence in part to rectify this weakness, in part to make a wealth of obscure knowledge available. It succeeds with great distinction. 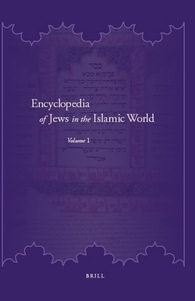 In contrast to some other recent encyclopedias concerning the Middle East and Islam (notably John L. Esposito's dismal Oxford Encyclopedia of the Modern Islamic World), EJIW's 350 contributors avoid post-modernism and other hazards to provide a well-written, reliable guide to 2200 topics from the seventh century to the present. Those topics range temporally from the Isra'iliyat (extra-scriptural narrative supplements to the Koran) to Ishak Alaton (a Turkish businessman), geographically from Casablanca to Hong Kong, and in spirit from the Farhud (a pogrom in Baghdad in 1941) to sports in Tunisia. The opening to the entry on music suggests the encyclopedia's satisfyingly large vision: "Music is the field of cultural productivity in which Jews and the peoples of Islam ... converged in the closest and most prolific manner." Entries in EJIW fall under six main categories, each with its own distinguished associate editors: Angel Saenz-Badillos for Al-Andalus; Meira Polliack for the medieval Arabic-speaking countries; Daniel Schroeter and Phillip Ackerman-Lieberman for the modern Arabic-speaking countries; Avigdor Levy and Yaron Ayalon for the Ottoman Empire and modern Turkey; and Vera Basch Moreen for Iran, Kurdistan, the Caucasus, and Central Asia. Congratulations to the publisher, Brill, for organizing this remarkable reference work. Congratulations to Stillman and his team for excellent work. Reviewed in the Middle East Quarterly, Sept. 1995, pp. 85-87.